Midnight Louie’s Pet Detectives ($23.95; Oct.; 352 pp. ; 0-312-86435-3): Douglas’s outspoken cat Midnight Louie (Cat on a Hyacinth Hunt, p. 852, etc.) 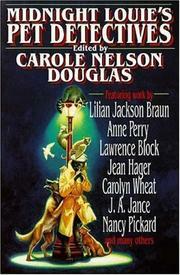 co-edits a collection of 17 mysteries whose dramatis personae include cats (Jan Grape, Carolyn Wheat, Lisa Lepovetsky, Elizabeth Ann Scarborough, editor Douglas, and, in the collection’s only reprint, Lilian Jackson Braun), dogs (Anne Perry, Dorothy Cannell, Bill Crider, J.A. Jance), raccoons, hamsters, birds, elephants, and a Tasmanian devil—all sandwiched between Lawrence Treat’s suggestion that the MWA Edgars be divided into Cat and Non-Cat categories and Douglas’s explanation of why anybody who doesn’t like animal mysteries is a few whiskers short of a puss.